Of skincare maven Helena Rubinstein's homes, much has been documented. 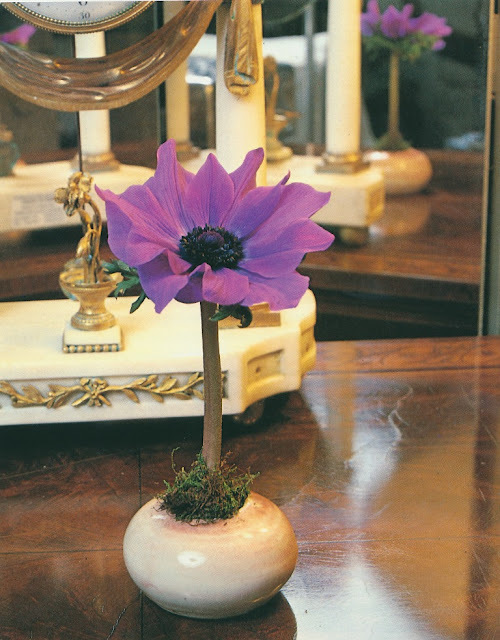 I've seen photos of her avant-garde Paris apartment as well as her Manhattan abode. But what about the homes of Rubinstein's great rival, Elizabeth Arden? 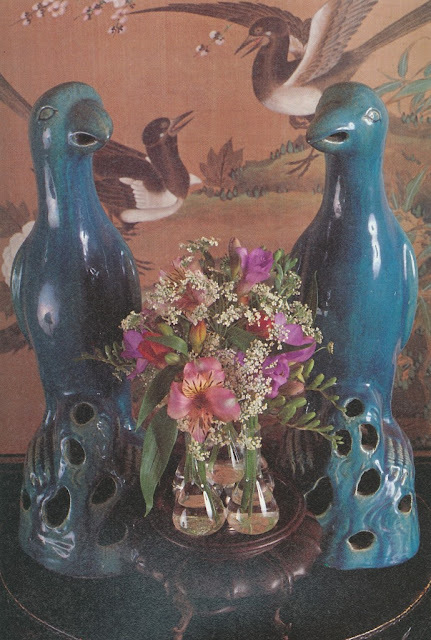 Other than images of her Irish castle, which was decorated by Tony Duquette, I've seen nary a photo to indicate how she lived back home in New York City. That is, until last week, when I found these 1933 photos of her Manhattan apartment. My heart skipped a beat, because most, if not all, of the early-Thirties design tropes are here: satin fabrics, robust brush fringe, mirror galore, a liberal use of stylized decorative motifs (in this case, plumage,) and a whimsically-appointed bijou bar. 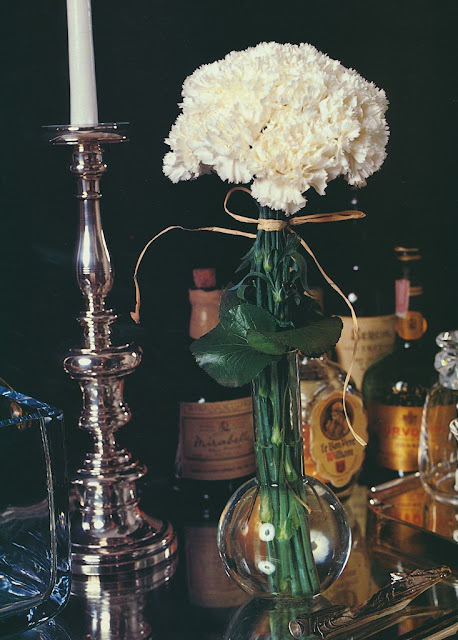 The apartment's decor is credited to Nicolai Remisoff, a Russian artist who fled the Bolsheviks, alighting in Paris and later New York, where he worked as an illustrator for various Condé Nast publications and owned a chic nightclub, Club Petrushka. Remisoff also achieved acclaim as a stage designer, whose theatrical background might explain the dramatic flair of Arden's home. (According to some, Remisoff was also responsible for designing Elizabeth Arden Salons throughout the country.) 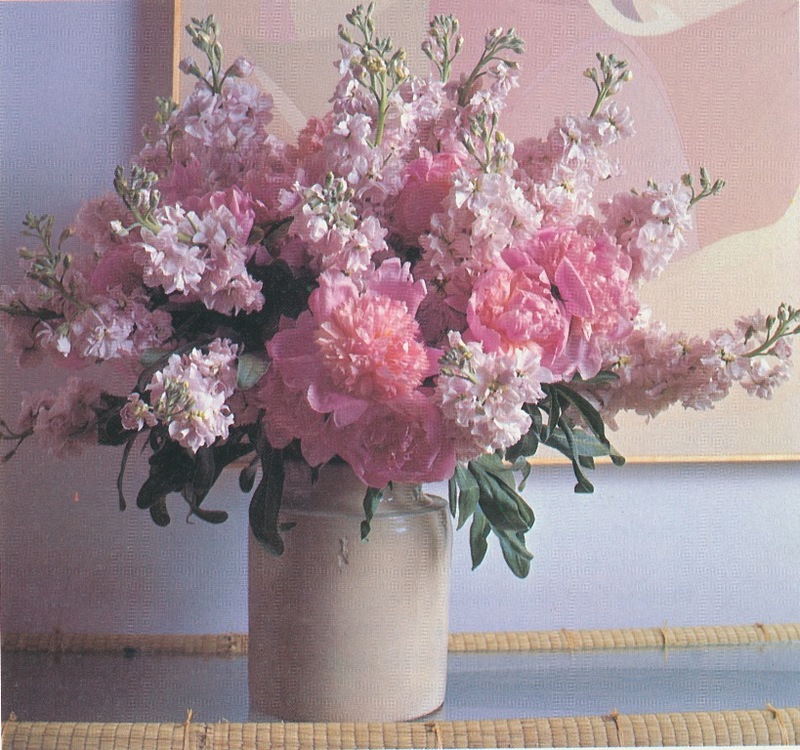 After interludes in Chicago and San Francisco, Remisoff finally settled in Southern California, dividing his time between houses in Palm Springs and Los Angeles, where he worked as an art director and production designer on a slew of Hollywood movies. In fact, his swan song in the film industry was art directing that 1960 Rat Pack classic, Ocean's 11. I suspect that if the apartment had been shown in color photographs, I might be a little less enthusiastic about it. I'd rather not see how the solarium furniture's red, white, and blue brush fringe really looked. 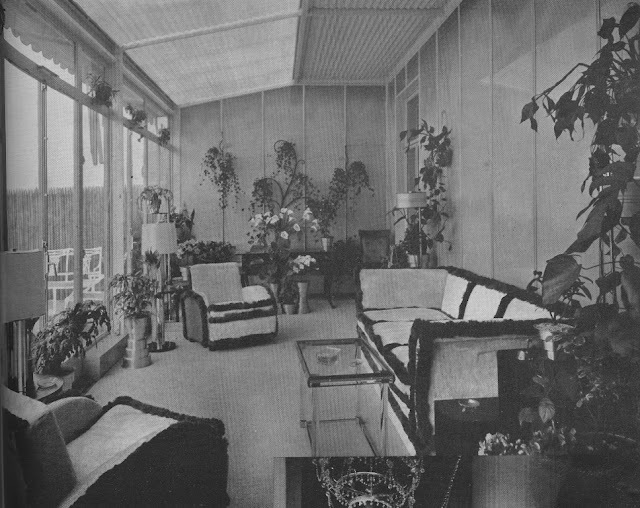 On the other hand, how striking the living room's pink, gray, and chartreuse color scheme must have been when not inhibited by black and white photography. 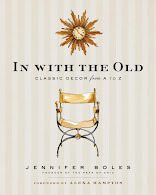 But color or no color, the home still makes quite an impression, even eighty-plus years after it was published. It's dramatic, flamboyant, glamorous, and, yes, even over the top- basically, everything I hope to see in an early-Thirties interior. 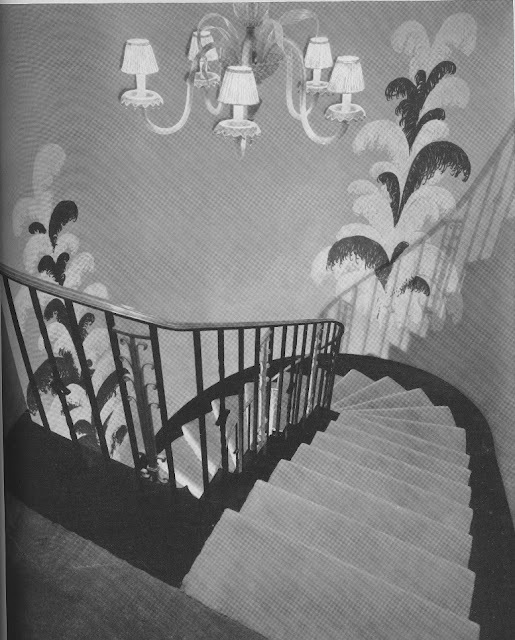 Image at top: Along the stairway, the French gray walls were adorned with painted feathers in shades of white, black, and gunmetal. The steps were made of black marble and were softened by an ivory carpet runner. 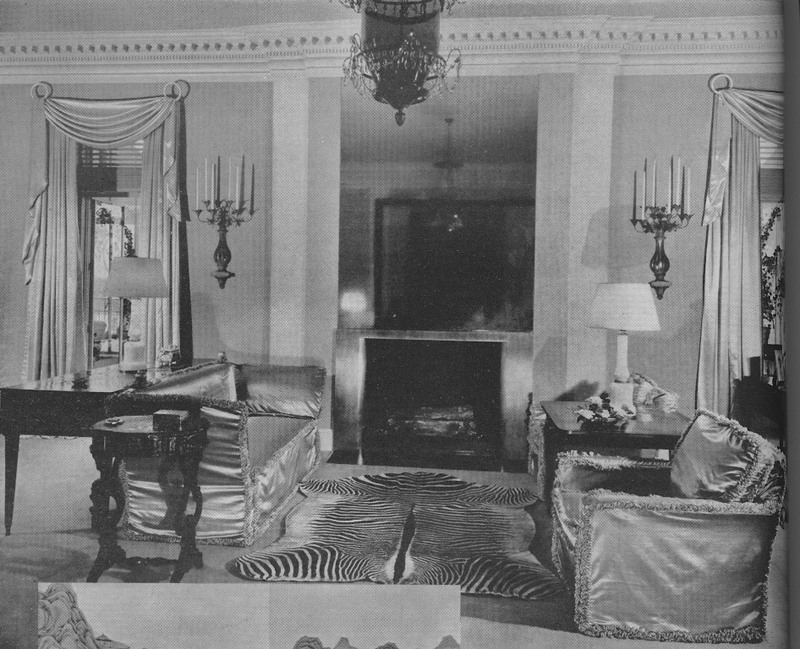 The living room had gray walls, a pink ceiling, and a polished steel fireplace flanked by gray glass pilasters. 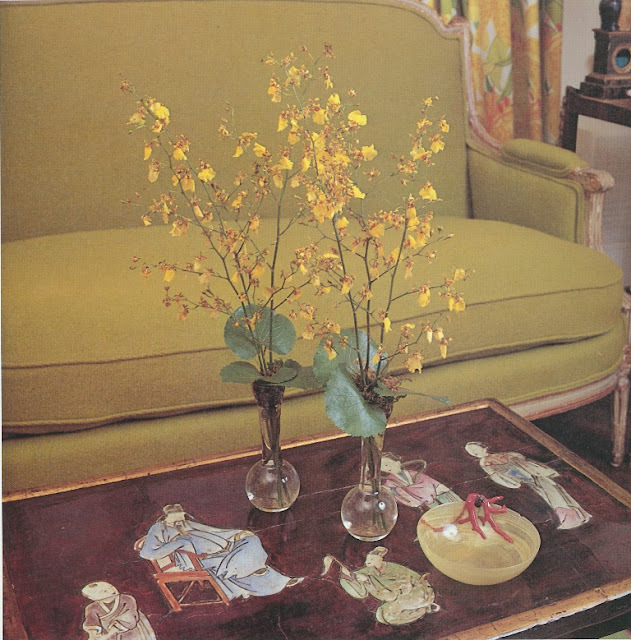 The curtains were made of pale pink satin, while the draw curtains were chartreuse taffeta. 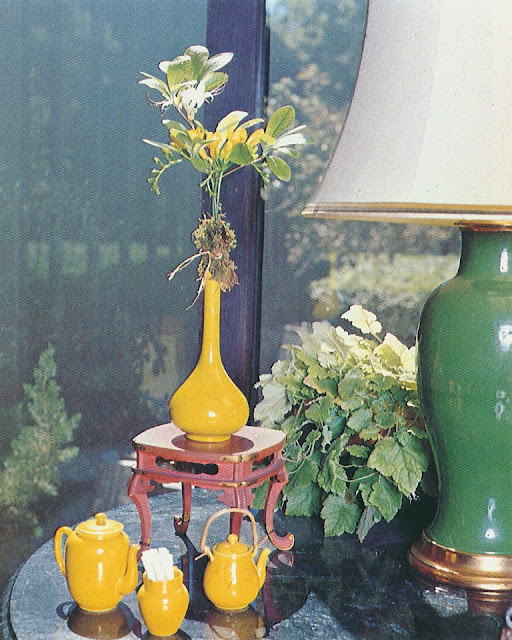 The furniture was covered in chartreuse satin. 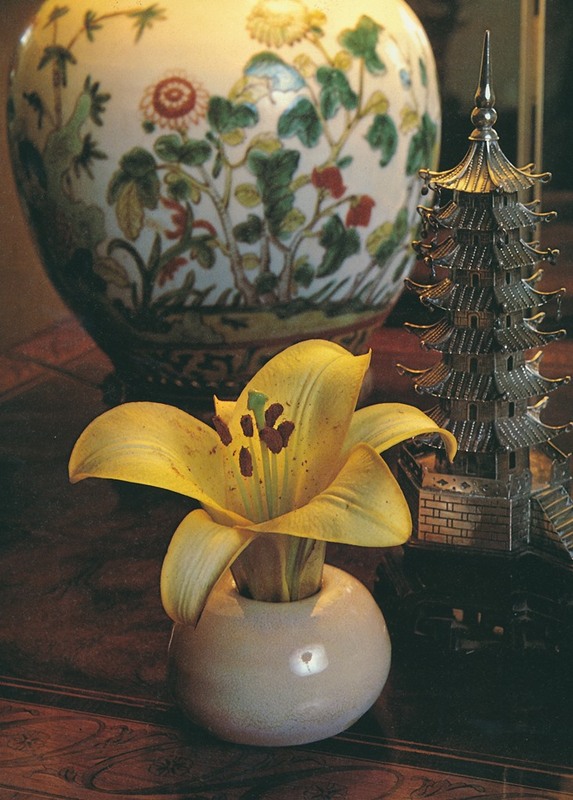 The dining room featured antique Chinese wallpaper in tones of beige, gray, and green. The rug was clipped goatskin. 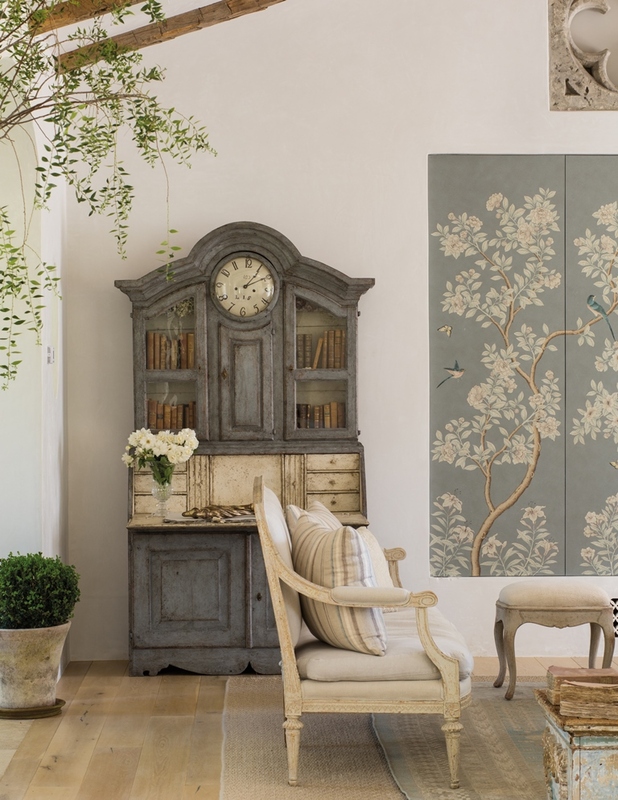 The folding screen seems to have a middle panel painted with yet another plume of feathers. The solarium, which offered views of Central Park and midtown. The walls were painted glass which was meant to "represent a sky-scape." 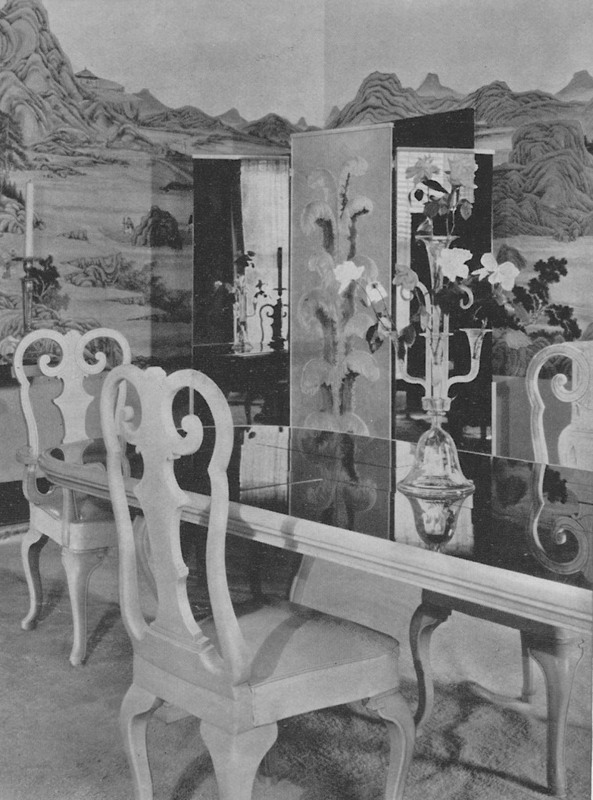 The furniture was upholstered with white plush and trimmed in red, white, and blue fringe. The bar. 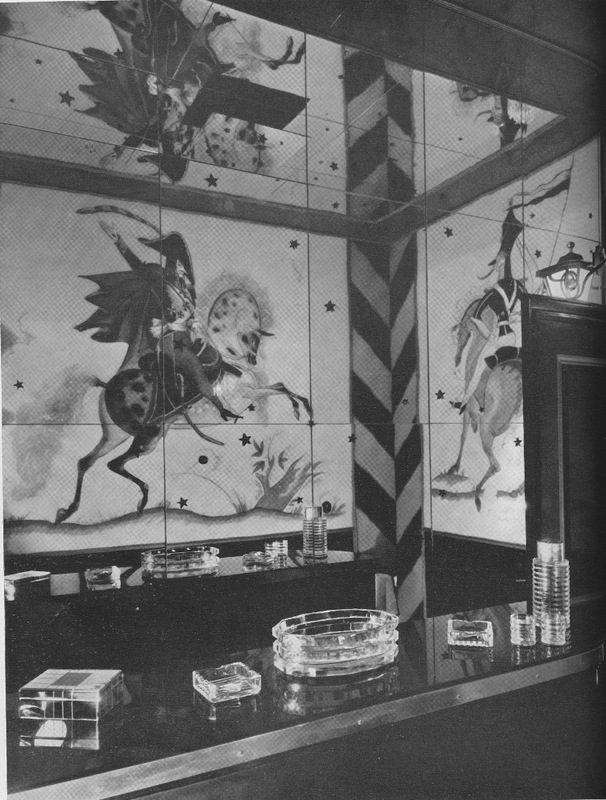 The walls were clad in verre-églomisé panels that depicted dashing French officers on horseback. I assume Remisoff was responsible for painting them. 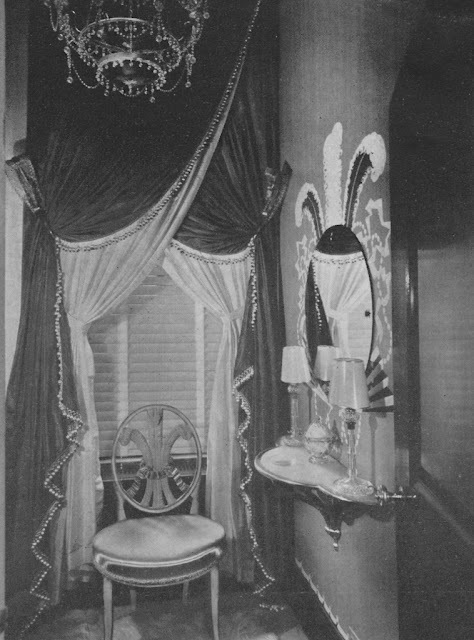 A rather flamboyant powder room, which had painted feathers on the wall. In keeping with the theme, a chair with a Prince of Wales feather shield back and a set of crystal feather curtain tiebacks. The walls were painted to emulate orange draperies. The blue taffeta curtains were designed by Elsie Cobb Wilson. All images from House & Garden, March 1933. I've been making my way through some of the new Spring book releases, which have kept me happily occupied for the past few weeks. 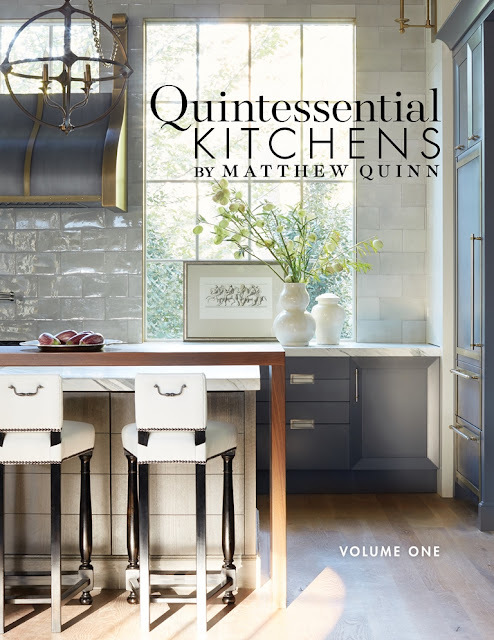 First up is Quintessential Kitchens by Matthew Quinn: Volume One by kitchen and bath designer extraordinaire, Matthew Quinn, owner of the esteemed kitchen and bath studio, Design Galleria. 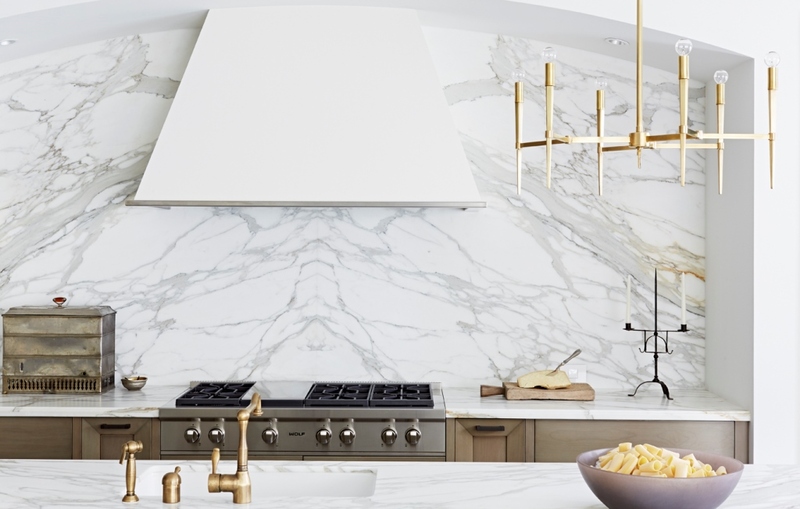 Quinn, a fellow Atlantan with a reputation for being one of this industry's nice guys, has designed kitchens and baths for a slew of high-profile designers and clients both here and abroad. 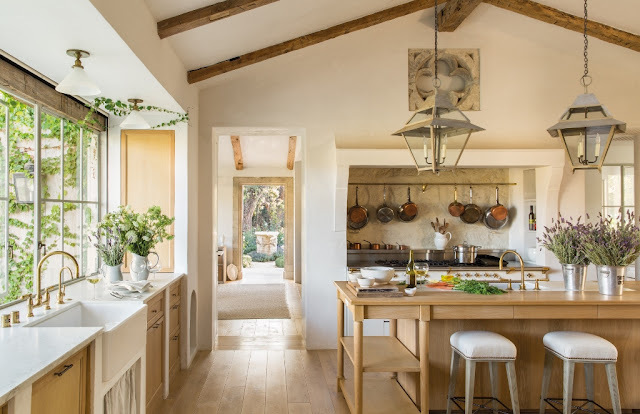 Whether a Design Galleria-designed kitchen is contemporary, traditional, high-style, slightly casual, large, or small, it is, above all, highly functional. The mark of Quinn's work is that practicality is never sacrificed for style. 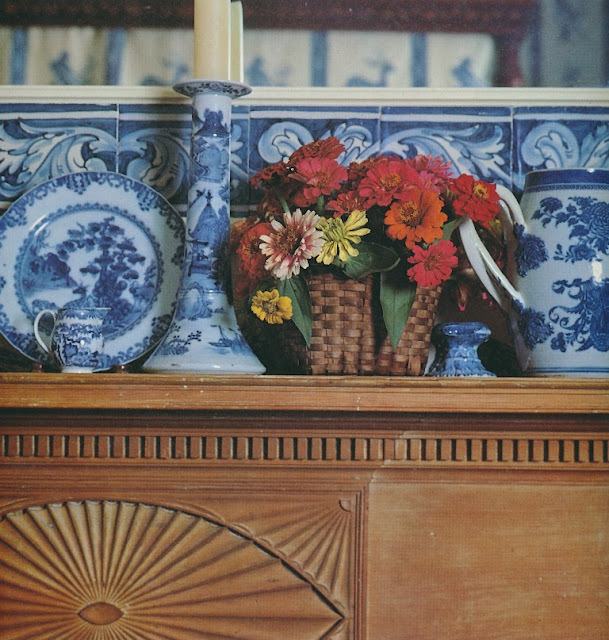 Quintessential Kitchens profiles fifteen kitchens (some of which can be seen above) that represent the diversity of Quinn's work. 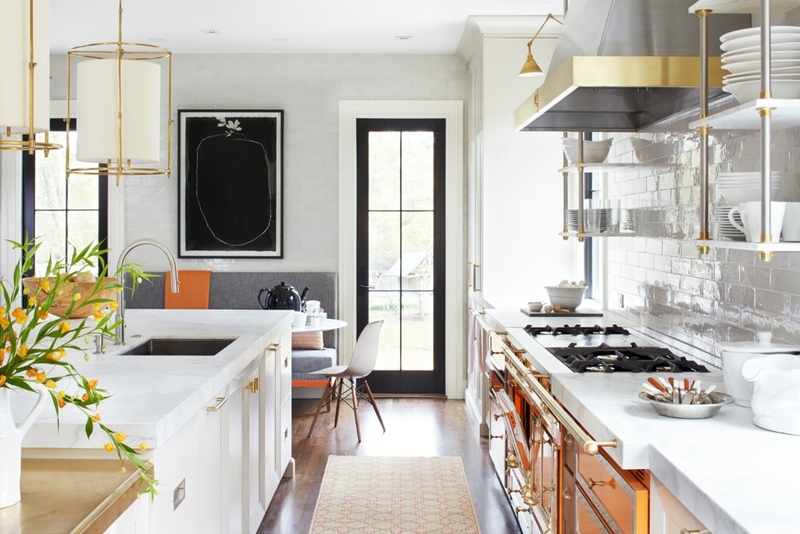 Some have a cosmopolitan feel, while others are reminiscent of those great old kitchens of the 1920s and 1930s. What they all have in common, though, is that they convey the "clean elegance and simple sophistication" (Quinn's words) to which the designer strives. Shown in large, compelling photographs, the kitchens will have you seriously considering an upgrade to your kitchen. 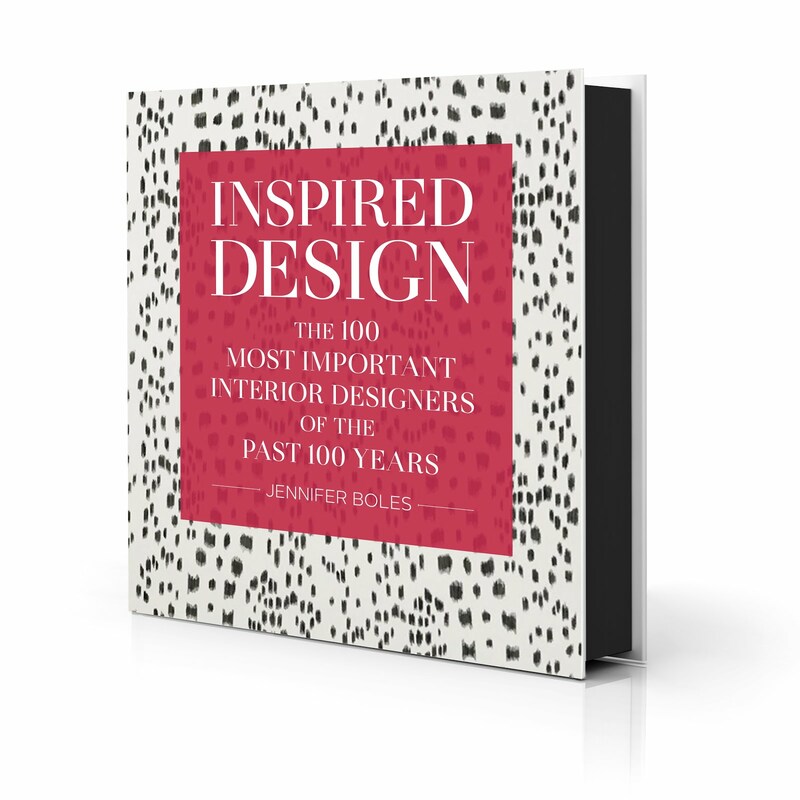 And if you read Quinn's informative text, you'll also understand the considerable thought and consideration that goes into designing a well-planned kitchen, making this book a must-have title for interior designers especially. To order a copy, please visit the Quintessential Kitchens website. 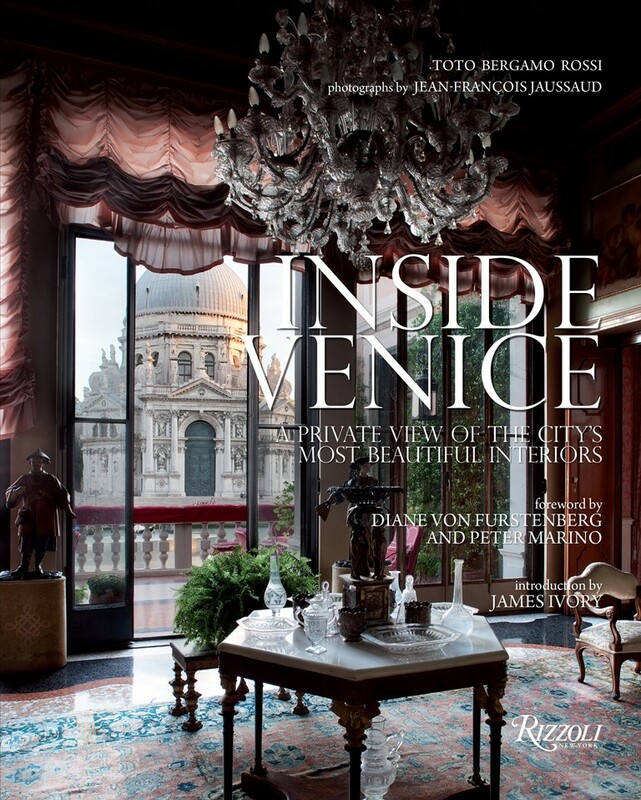 Now on to Venice, or, technically, Inside Venice: A Private View of the City's Most Beautiful Interiors. This recently-published title, which had not been on my radar, was such a pleasant surprise. Written by Toto Bergamo Rossi, Director of the Venetian Heritage Foundation, with photographs by Jean-François Jaussaud, Inside Venice takes the reader beyond the threshold of seventy-two Venetian architectural gems, including churches, public institutions, and, most significantly, private homes and palazzos that the public rarely sees. 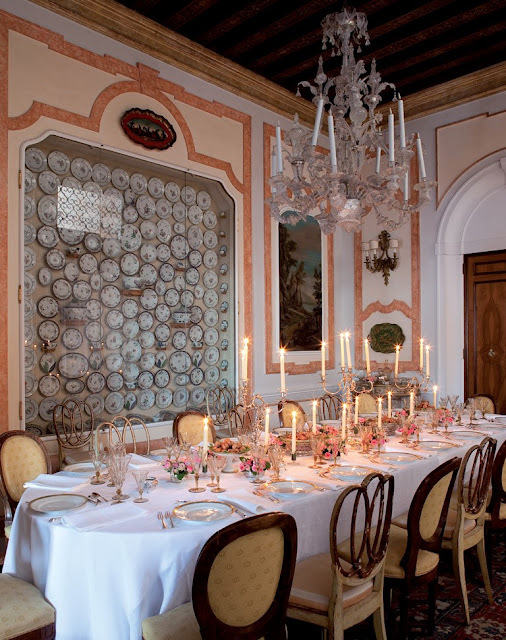 On page after page, you'll find a wealth of centuries-old stucco, frescoes, mosaic floors, and shimmery glass and mirror, all of which reveal Venice's elegant past. 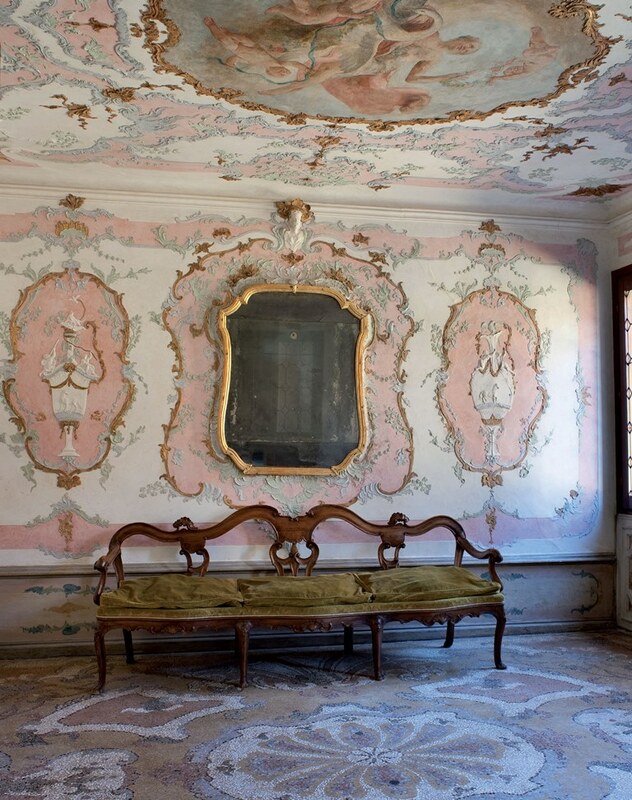 And while the churches and museums are, naturally, inspiring, I found the photographs of the private residences most intriguing. 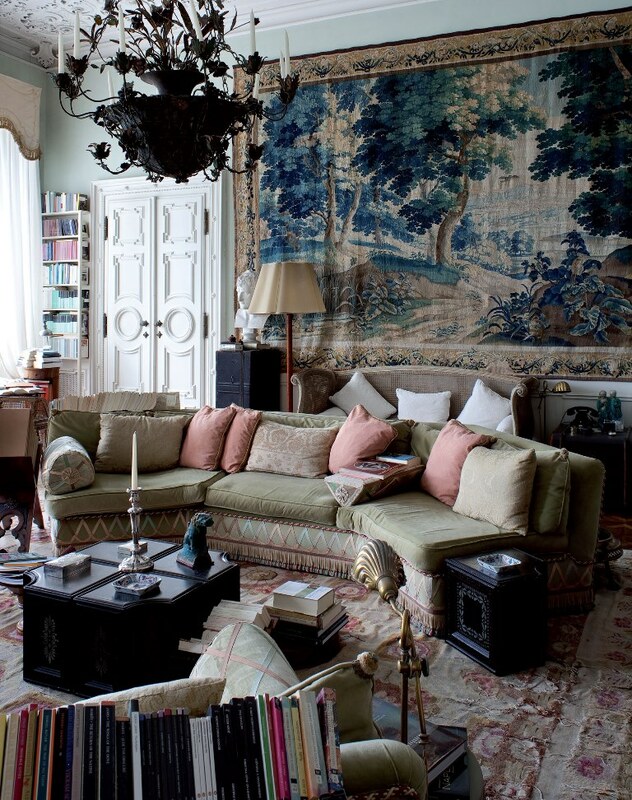 No surprise, it was the palazzos appointed with Fortuny fabrics and antique rugs, paintings, furniture, and porcelain that got my heart racing. 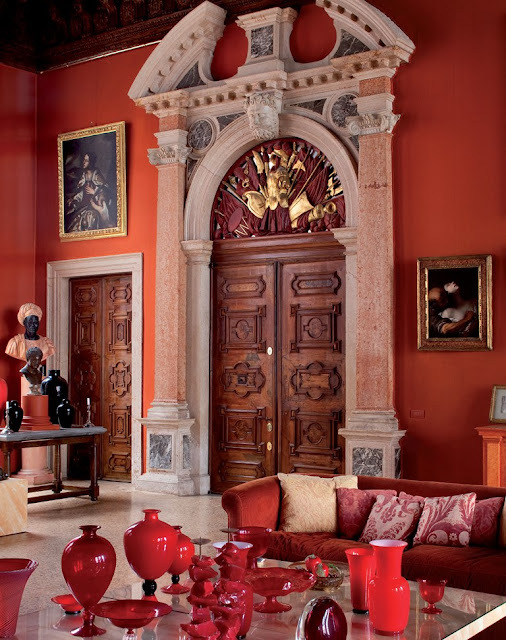 But even Venice's most modern-minded homeowners seem highly-respectful of their historical surroundings, preserving the architectural integrity of their palazzos while sensitively furnishing them with contemporary furniture and art. 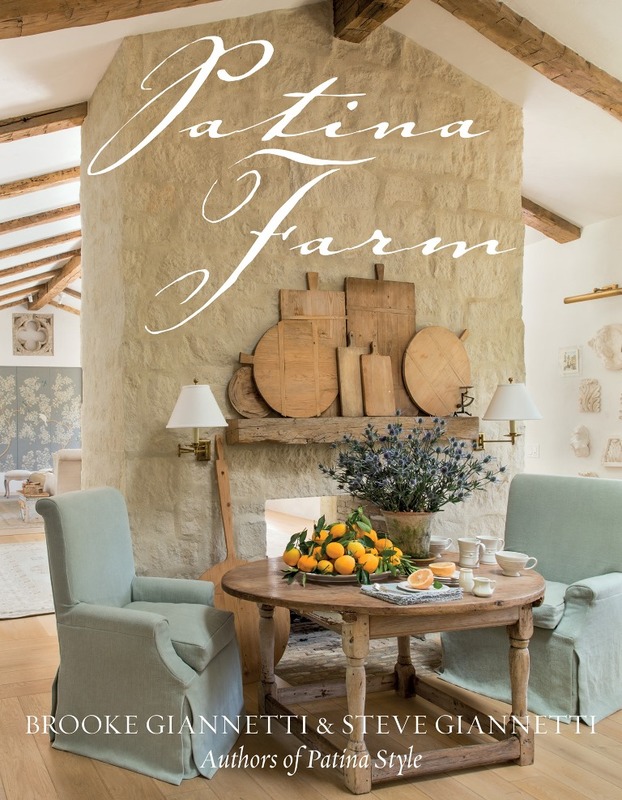 By now, you've likely read the collective praise for Patina Farm, the second book written by the talented Brooke and Steve Giannetti (designer and architect, respectively.) I concur with other reviewers because the book is a delight to read. No mere room-by-room catalogue of a prettily-decorated house, Patina Farm is the story of a life envisioned- specifically, the desire for pastoral living in Ojai, California- which became a reality thanks to the Giannettis' hardwork and creativity. The book takes the reader on the journey from the farm's conception to full fruition, which is, I must say, quite enviable. I'd like to add that even if your aesthetic is different from that of the Giannettis, the book is nonetheless inspiring. It will remind you of what can happen when you dream big. 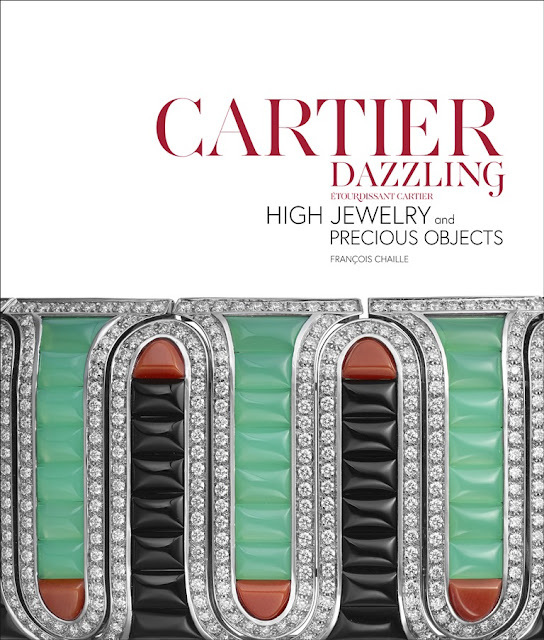 And last but certainly not least, Cartier Dazzling: High Jewelry and Precious Objects by François Chaille. Yes, the book is chock full of beautiful photographs of Cartier's sumptuous jewelry, of which I never tire. 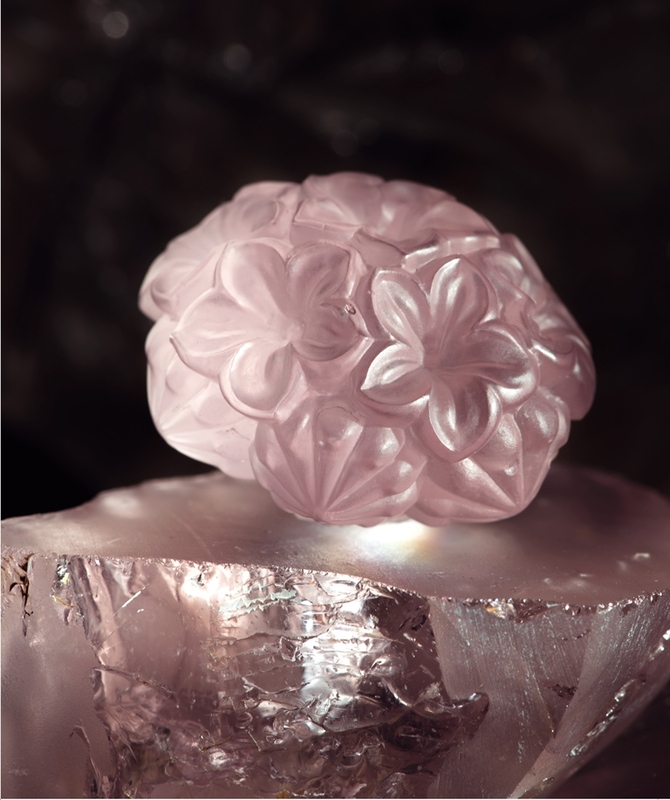 But if social history is more of your thing, you'll want to join the jewelry connoisseurs in reading this book. 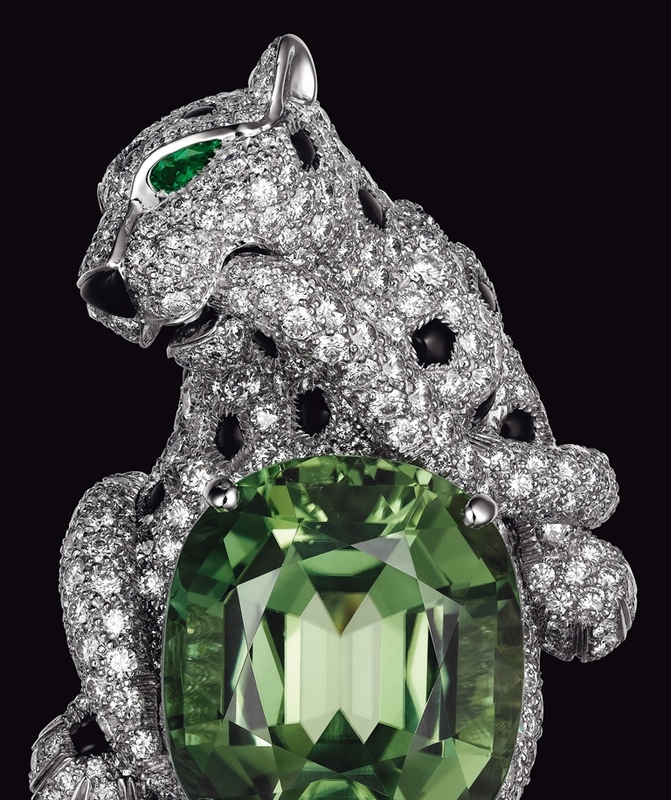 Alongside Cartier's signature jeweled panthers and tutti frutti confections are stories about Cartier's history and its rarefied clientele, which, last century, included maharajas and much of café society. 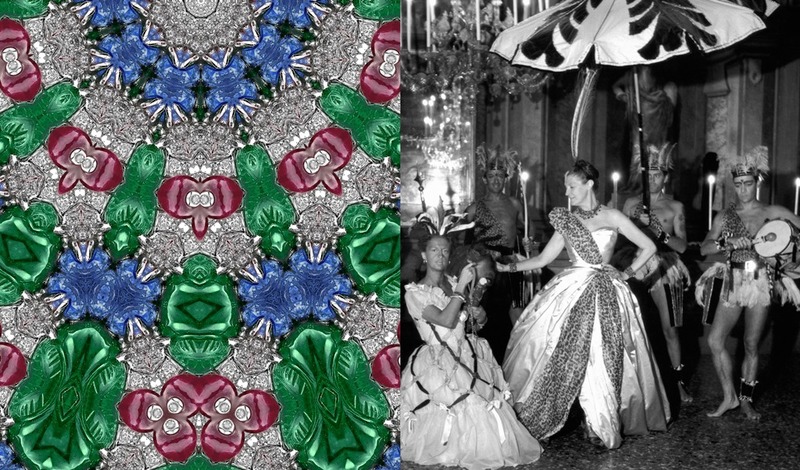 In fact, there is a brief chapter on the Cartier jewels that were worn by guests to Carlos de Beistegui's costume ball at his Palazzo Labia in Venice, not to mention mentions of Linda Porter, Daisy Fellowes, and Barbara Hutton. 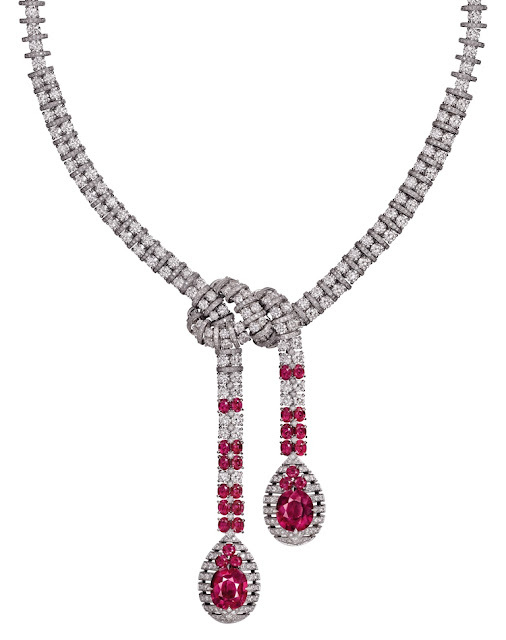 This book will have you pining for Cartier jewelry as well as those bygone days of glamour. If you're planning to attend High Point Market in a few weeks, you should make an effort to visit Potterton Book's pop-up shop at the Currey & Company showroom (IHFC M110.) 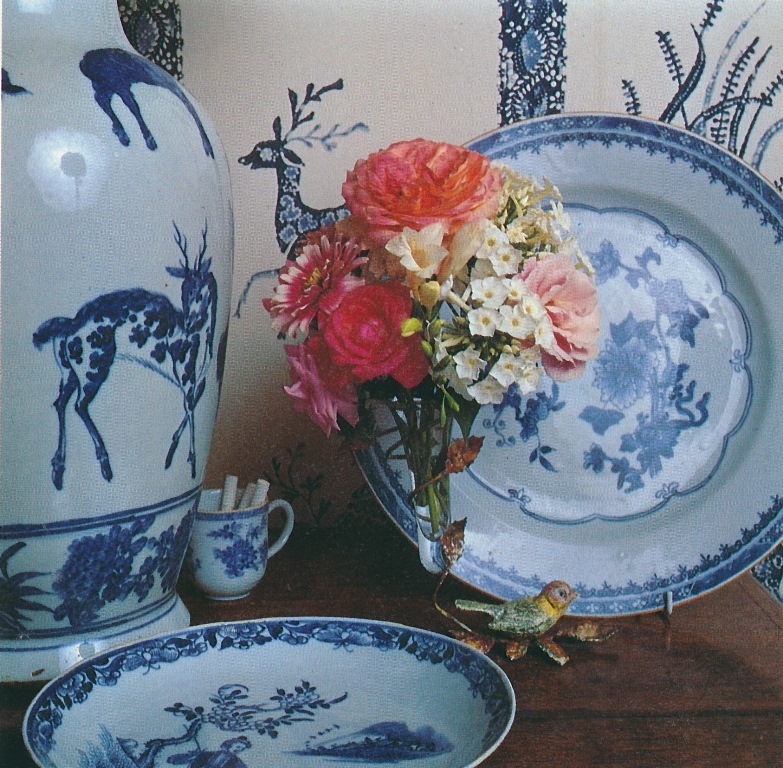 Design book collectors are likely familiar with Potterton Books, the U.K.-based purveyor of out-of-print books on design and the decorative arts. Founder Clare Jameson will be on-hand selling a well-edited mix of books, including French 19th-century woven and printed cotton textile swatch albums with original samples as well as a monograph of 20th-century designer Andre Arbus. 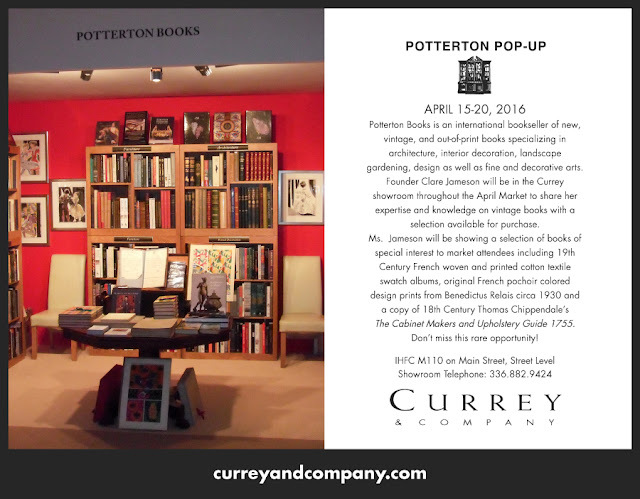 The pop-up will be open from April 15-20. In honor of pollen season the arrival of Spring, I'm giving you flowers, courtesy of Ronaldo Maia. 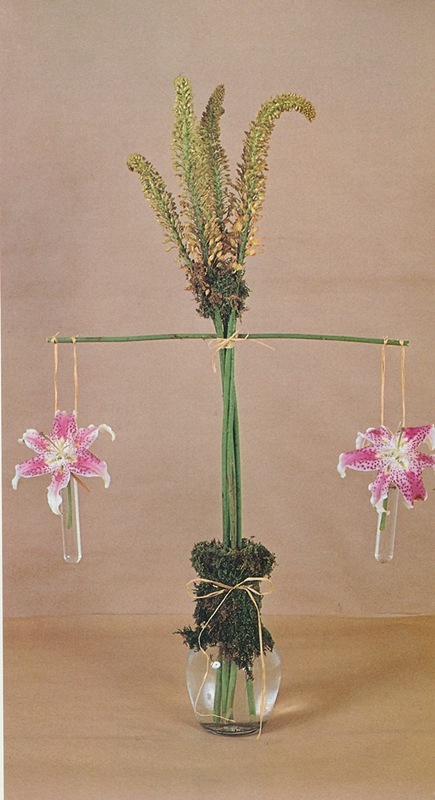 Maia, who for decades has been one of New York's premier floral designers, fashioned these blossomy creations for his debut monograph, Decorating with Flowers, which was published almost forty years ago- hence the dated-looking graininess of the book's photography. 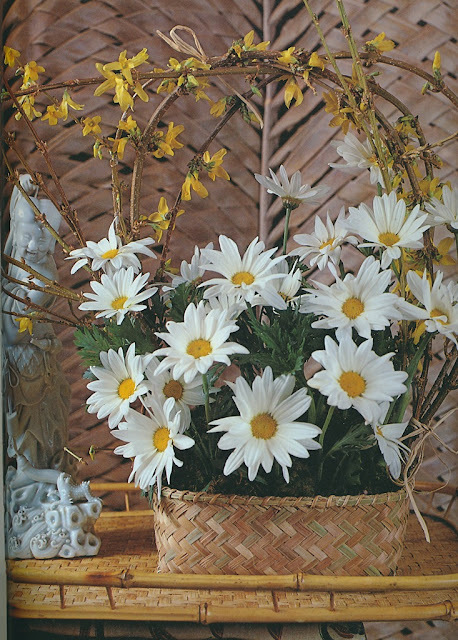 But no photographic deficiencies can diminish the charm of Maia's timeless arrangements, whose simplicity is offset by a richness in their surroundings: Chinese porcelain, simple ceramic containers, wicker baskets, and bottles of cognac. 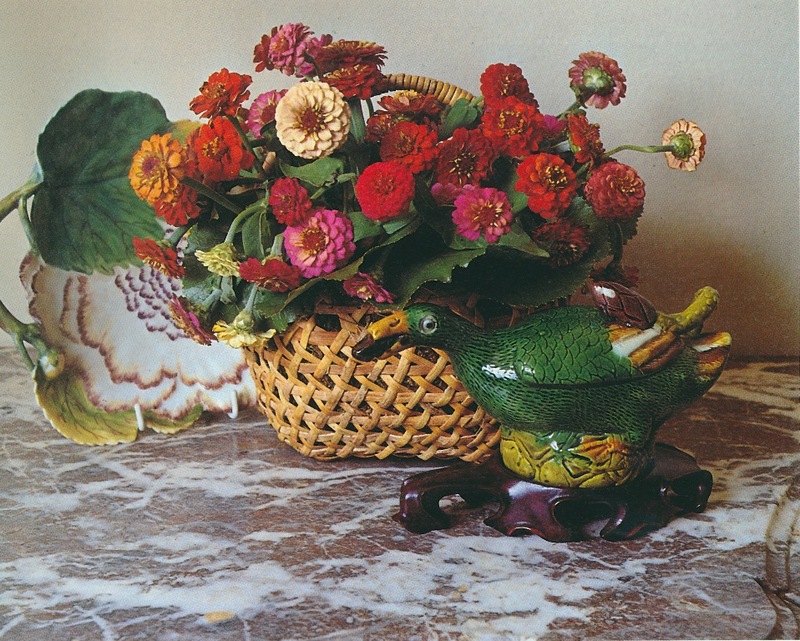 For those of us who appreciate both flowers and the decorative arts, these still-life snapshots are a bounty for the eyes.